In my previous blog I wrote about creating a climate for spontaneous speaking in a classroom setting. Now, I want to get down to the nitty-gritty of words that students should aim to use with a degree of spontaneity. Firstly, for this to happen, students need to practise learning the key vocabulary. In my view, Memrise.com is without doubt the best way of helping students learn new vocabulary fast. However, for it to be truly effective, the teacher has to reinforce the vocabulary in a variety of contexts which forces students to use their listening, writing, speaking and reading skills. The new vocabulary must be seen in context. Memrise is great but it won’t make students use new vocabulary with spontaneity. So, what words or phrases do I want to hear spoken in a mixed ability classroom? I think there are five elements to this question. 2) Choose language that students actually say in English in your lessons and teach it to them in the target language. For instance, I play a number of language games with my classes and sometimes I cheat. They generally say ” You’re cheating/it’s not fair/I know you’re cheating because you are smiling” Now, they say it in French quite naturally. This is useful with behaviour management too and can sometimes diffuse potential confrontations. For example, a student refuses to move seats because they are constantly off task and distracting others. I have taught them to say things like ” you are rubbish, you’ve got bad breath, I want to leave the class, I am fed up with you” Once, they have said these types of phrases to me, they are more likely to move because they got rid of some of their frustration. I’m happy too because I got them to practise using key verbs in a context. Win-Win! 3) Insist that students use vocabulary all the time. All language games, asking questions, checking work, going to the toilet, music lessons etc must be said in French. Given that I occasionally reward volunteers with a sweet, the motivation is quite high. I also encourage students to shout at each other in the target language. The key phrases we hear are “you are lying, it is my turn, you’re kidding, you’re crazy, I don’t agree, you annoy me”. These exchanges are conducted in a playful manner and students understand fully the rules about treating each other with respect. 4) Never give students a sheet with key words in both the target language and English. As John Lennon once sang I’ll say it again, never give students a sheet with key words in both the target language and English. In my view, this kind of “support” disincentivises students from actually committing words to their long-term memory. 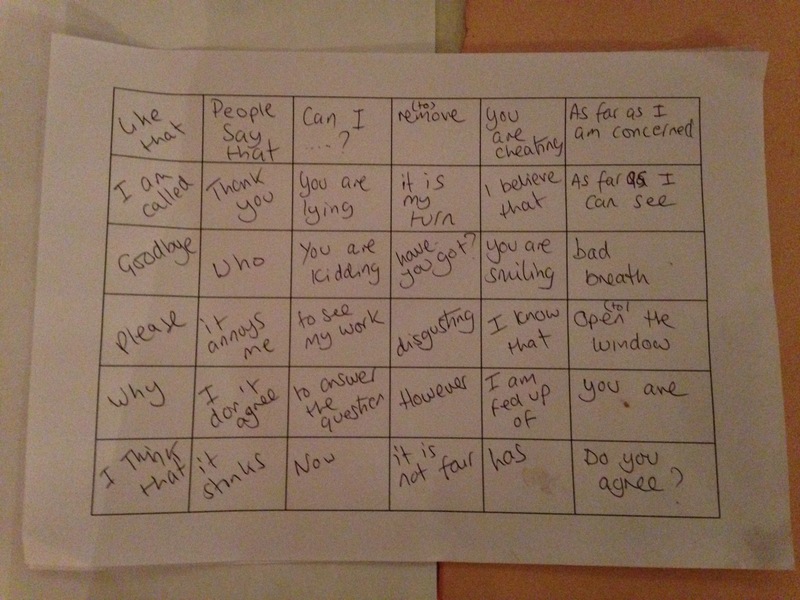 My students have a sheet like this in their exercise books with some of the key words they have learnt. 5) Working with mixed ability students means that I ensure they learn phrases at their own pace. For those who struggle with retaining new words, I focus on words like “please,thank you, it is my turn,I am called” etc. Whereby more able students will construct very long sentences sometimes using words from the above image. Well, you maybe wondering does all this blah-blah I have been writing about actually work in practise? Below is a video by year 7 students who had been studying French for seven months.